Selling your Soul for the new Mercedes CLA? Merkley and Partners, along with MJZ's Dante Ariola and The Mill LA, have collaborated to give you a sneak peak at the soon to be released Mercedes CLA. 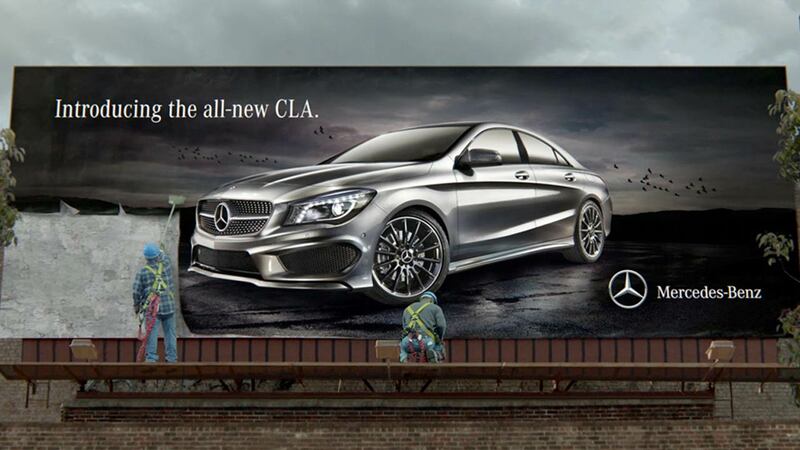 The epic Super Bowl spot shows a man fixated on a nearby billboard which features the new Mercedes CLA, as he contemplates how amazing life would be if only he had the opportunity to own one. The devil appears, offering the car and everything that goes along with it. At the end of the spot, the price is revealed and is so affortable, our hero realizes he can have the car without selling his soul. He declines the offer and the devil vanishes in disgust, leaving our hero wondering what happened! VFX Supervisor and Lead Compositor Tim Davies explains how the team was required to create a considerable amount of VFX work to compliment the spot. "We worked extensively in creating the CG particle simulations, which formed the basis of the disappearing effects for both the car at the end of the race, as well as the vanquished devil." The billboards also required a substantial amount of work as the team needed to create these from many plates and stills from New Orleans and around. The poster itself needed to also serve as the beauty shot for the commercial as well as clearly communicate it's remarkable price, the crucial element of the spots plot. Unfortunately, The F1 car that the CLA had to race against was only available to be filmed in Europe, so as a result The Mill's CG team needed to build a photo-realistic Formula One racecar for the CLA to compete against. Production filmed a smaller Formula 2000 Car as a stand-in to frame up to, later replacing it with the CG Formula One Car, as well as adding additional cars here and there. "The F1 Mercedes model needed to be super detailed and clocked in at 15 million polygons," explained 3D Lead Artist Simon Brown. "I was proud of the car-paint treatment we gave it. Definitely not an ordinary car paint job." The team also created CG crowds and stadium fencing to populate the racetrack making for an exciting competition. The Mill's strong team of artists relentlessly finessed every pixel, making for a stunning commercial worthy of Super Bowl 2013.